When it comes to this group, we don’t realize that they aren’t just the first to graduate high school or college. As a result, they are also the FIRST to deal with student loans, etc. This didn’t cross your mind? Don’t worry, it is not anything I thought about either. We’ll get into this challenge and so much more as we get to know my special guest Natalie Torres. I’d love to hear from you! What was the one takeaway from this episode for you? Be sure to share with us in the comments below or over in our community in Facebook! [00:00:26.3] JH: Hello, hello. I am so happy to have you here again but if this is your first time listening, I want to give you a big welcome and a thank you for being here. There are so many great podcast out there and personal finance podcast out there but you choose this one. So I am truly, truly grateful. If you haven’t already, be sure to join us in our Facebook community. 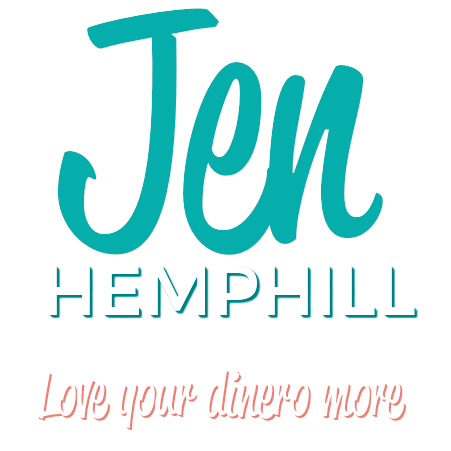 We have a lot of fun over there and it’s really simple to join, you just go to jenhemphill.com/community, click join and we’ll add you or you can simply when you’re on Facebook, go to the Facebook search bar and just look for Her Money Matters. So I hope to see you in there. In today’s episode, I’ve got a great guest, very accomplished at her young age. A fellow Latina so I am excited to have her here and what you’ll learn in today’s episode is the impact of growing up in the midst of the LA riots, what it had on her and what she learned. The specific rituals that she has when sitting down to manage her finances. 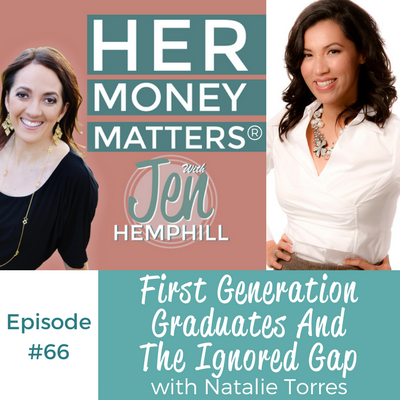 You’ll also learn the special money challenges we don’t think about for first-generation college graduates, and you’ll also learn what exactly happened in this one particular happy hour with her friends that inspired her book. So let me share with you a little bit about Natalie Torres. She’s a financial literacy workshop facilitator, a published author, real estate investor, a partner of educatedlatina.com and a business administrative instructor at the UEI College with a mission to uplift students everywhere. Her activities have been covered in the Los Angeles Times, ABC News, Fox News, Telemundo, to name a few. She’s also one of the 4% of Hispanics holding a master’s degree in the United States, a Women Making A Difference finalist of the LA Business Journal and a finalist for the best business book for International Latino Book Awards for her book Financial Savvy in 20 Minutes. Her dreams realized from an unlikely background raised in Inglewood, California during the LA riots, a city surrounded by major economic barriers. So let’s go ahead and meet Natalie. 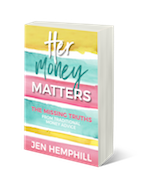 [00:03:01.4] JH: Welcome Natalie Torres to the Her Money Matters Podcast. I am so happy and stoked to have you here. [00:03:06.7] NT: Thank you, I’m excited to be here. [00:03:08.9] JH: Well this is a special interview for me because you’re Latina, I’m a Latina, we’re both in the area of personal finance so I am really excited to talk to you, hear about your background, all that good stuff. So are you ready to dive in? [00:03:22.7] NT: Oh absolutely, let’s do this. [00:03:24.6] JH: Perfect, so tell me a little bit about how you grew up around money and your money story? [00:03:31.0] NT: Well how I grew up around money has different meanings to me. I come from a family of immigrants, myself being one but my parents left during a civil war and growing up in Inglewood, as most people know the city, lack of resources was something that definitely I was surrounded by. But luckily for me, I think the benefits of my parents, they did show me how to save and to be ready for the unexpected. Obviously, for them, they left during a time of war. So you never know what’s going to happen but having some kind of a little cushion is always important to have. So growing up in a neighborhood where there’s definitely lack of resources and money as something that I saw, I was fortunate enough that my parents sent me to private school for high school and so I was all of a sudden surrounded by very wealthy students and very wealthy families and I got to see both sides of what it is to have money and how to deal with it and how the wealthy handle their money as opposed to those who are just trying to get by and save a little for the long run. So I felt really fortunate that I got to see both sides of it and I grew up during the time of the LA riot. So coming from Inglewood and seeing, you know, your local neighborhood shops and grocery stores being burned to the ground really had an impact on me that I knew I wanted to make sure I had the financial means to make sure that my family and myself would be safe. [00:04:56.9] JH: Wow. Now tell me a little but about — okay so you were born in El Salvador? [00:05:04.0] NT: El Salvador, yes. [00:05:05.8] JH: Okay. So I wanted to make sure I got the right country and so growing up a little bit in El Salvador and immigrating to the US, tell me a little bit about the money, well one, the money conversations that your parents had with you and maybe a little bit about the culture, what beliefs around money in that culture? [00:05:29.7] NT: Yes, so for me I was a baby when my parents migrated here. So mostly I grew up here in LA and the conversations that I had with my parents came with a side of “you have to always save for something in case something were to happen”. My mother worked in the hospitality industry for many years and my father was self-employed and working here and there. So money was usually not only tight but it was something that we talked about, not on a consistent basis as I would have liked to, but I think it was something that they made it very clear that if you don’t have anything saved up or you don’t have some kind of means to get you to the next point, there’s definitely got a lot of problems but I think the nice thing that I really grew up with in my family with our culture, there is a lot of taboo unfortunately with money and it’s almost like you don’t want to speak about it because of the taboos that are brought around it unfortunately. However from my family’s side, my parents and my dad was on the entrepreneurial side of it and my mother was a hardworking, always working overtime if anything. So I did see the fruits of their labor and see that education also is something that can help you not only get a better job or do well later on but understand the financial side of it. So growing up as a child, especially in the Latino culture, it’s not something very common that we speak about money. However, our customs are showing and helping others and saving even if it is just a little bit at a time. [00:06:54.1] JH: Right and even though me being a Latino, we’re both Latinas, I wanted to ask that about culture because even though it’s the Latino culture every country in Latin America is a little different from how we speak Spanish, the lingo, all that good stuff. So I wanted to make sure that I asked that just because they’re some sort of difference in each country. So thanks for sharing that and what would you say are your challenges around money? [00:07:24.6] NT: My challenges around money, I think like most people, it’s the unknown factor of where the next big thing is coming from and I think my challenges have been just for myself because I have always been not only just an entrepreneur but I have my own business on the side as well as worked full-time and being able to balance that and my biggest challenge is just letting go of that fear and the more I learn to not only manage my money better but enjoy the process and the fruits of it, I think the continuous challenge is to make sure that it is coming in. It comes in so many different forms and I think that’s the biggest fear I hear a lot of people talk about. They’re just like, “Well I’m not sure how it’s going to get there,” and for me, I’ve always been such a planner since a child and for me, I plan so much that I think it has really helped me overcome that challenge and I’m still dealing with it as well always. I think it is like it is, it’s called a challenge because you’re constantly trying to make yourself a better person. [00:08:21.7] JH: Absolutely and I’m definitely a planner myself but I think being a military spouse, that definitely has helped me deal with the other side of the things thrown in last minute or things like that because that has taught me to be able to just not be so dependent on the plan and not, if something comes and falls by the wayside. That’s definitely been a learning experience. And you are married, so are you the money manager in your home? [00:08:56.6] NT: Yes, I am. We laugh at that but yes we do and I see that amongst most of my family and friends and clients that I come across, that women are just better money managers but also because in our house too we don’t have kids. We have two dogs, but we’re homeowners and rental property owners as well and I do a lot of the managing not because of my financial background but my husband feels a little bit more comfortable knowing that I handle a lot of that stuff. Especially when it comes to, and as women, as nurturers, the groceries along with the day to day stuff and getting contractors when you need it and all of those things. So I think that’s why it fell upon me and I’ve always been that way anyway so it works out for both of us. [00:09:39.3] JH: Perfect. Now could you take us through maybe a month, just briefly, of how you manage the money in your home. Whether, do you use a spreadsheet, do you sit down with your husband and maybe talk once a week or once a month? How does that look for you specifically when you manage your money? Take us for about 30 days. [00:10:01.1] NT: Yeah, so it definitely is an ongoing thing. So it’s more at least a weekly thing for me, but yes for 30 days let’s say, I have some of my actual rituals. I call them rituals because I have to and I think everyone should make managing their money fun, and for me, one of my rituals is when I am paying bills, when I am organizing what our expenses are for the month, I do have my desk and sit down. Luckily, I get to work at home as well so I do have that setup. But what I do is put a candle and I have some just light music on the side and it brings this atmosphere of I am ready to do something that’s well for my family, that’s well for our future. I do have a few spreadsheets. What I actually have are folders and each folder has, and I can definitely send this to you too as well, but has the breakdown of what our expenses are for our utilities, for our rent. So management fees that we have for our properties that we own. For expenses for groceries, anything, it’s certain folders that are something that you deal with every month basically out of expenses and insurance. So I do have everything like I said, I am a very organized person so I have my little, my husband calls it the accordion box because it has — I even say it, if God forbid I pass or he passes, I go, “That box is that you run out with because it has all the information or passwords or account numbers.” Being organized allows me to glue my financial stuff quickly and I think that’s really important when someone is trying to get a handle and I think that’s the overwhelming feeling that most people feel and I totally understand how it is to pay down your bills and just deal with money overall. So if I make it fun and quick and pleasant, it becomes like I said a ritual like, “Oh okay.” Every week, even every day I check here and there especially if we have a lot of expenses coming up or things like that. But having a track of that, writing it down really does help. I use Excel, I keep it pretty simple. I do like Mint.com as well but I think that’s one of the things that I see, if I keep it simple and I see a handwriting of some of it, it allows me to feel like I have accomplished something as well especially paying down debt and managing money here and there. [00:12:10.7] JH: Love that, yes definitely I agree. Keep it really simple so you actually do it. Don’t overwhelm yourself because we have enough in the day to do. [00:12:34.3] JH: Absolutely, I like that, it should be enjoyable, key thing. What would you say is your best money spent? [00:12:40.8] NT: My best money spent; I think for me I just love to travel. So I think some of the best money spent is just taking off and the most recent one a couple of years ago actually, I did a backpacking trip with one of my friends and it was a great experience for me just adding to your element. Did have to save some money for that of course and I think planning is key, especially when you travel, you could plan so much but then everything could go wrong, right? And I think that was the best money spent as well because with my background education and everything that has helped me to get where I am, I think being able to travel too helps because you do have to plan a little bit and be ready for the unexpected. So I think my best money spent was on that travel trip just buying the plane tickets, the boat rides, the bus here and the places we’re going to stay and the great museums we wanted to attack, so definitely money well spent. [00:13:38.7] JH: Love it and how about your proudest money moment? [00:13:43.0] NT: My proudest money moment I’d have to say is probably my first property that I bought on my own. Prior to that, I bought something with a partner but I think that feeling of “I can count on myself and I can provide for my family in the future” and I think it’s part of that, maybe it’s part of that Latino culture too but owning your home is part of the dream. But for me, it wasn’t necessarily “oh the dream”. It was just having a little more sense of independence and being able to provide for myself. And at the time I wasn’t married too so I think that’s something that I wanted to be able to bring to the table with my partner. So that was definitely one of my proudest moments. [00:14:18.8] JH: Awesome and a home owner sure is a big deal for sure. [00:14:21.7] NT: Absolutely. Especially at a young age too. [00:14:25.3] JH: Yes, absolutely. So who would you say influenced you most in the area of money? [00:14:31.0] NT: Well definitely I think we’re proud of our culture or our environment, and so my mother definitely influenced me a lot because I did see her sit down on the kitchen table and pay down bills and we didn’t talk about it as much as I would have liked to but I think just being able to see that, she handles the money as well as my dad having his own business too. I think that is something that he was very consistent about like, “Here are the receipts, here’s his stack of expenses,” and being able to be around that was very helpful. And I was also very lucky to have mentors growing up and into college and even after in my career as well. So I think I have a few and my most recent mentor I think has really helped me just be able to keep it on track and just able to handle anything that comes in front of me. So I am lucky that I have many people that have influenced me. [00:15:23.2] JH: That is awesome and how about maybe a money guru celebrity, your favorite one? [00:15:28.9] NT: Hah, I laugh about because two have changed but I think have always been in the back of my mind. I did read Robert Kiyosaki’s Rich Dad, Poor Dad in college when it first came out and it really did, I felt like it reflected a lot of my life like, “Oh that happened to me, well I went to a public school and then went to one of the best private schools in a great area,” and it was automatically an eye opener for me. So his books have been really helpful, and I think if you look at Tony Robins now too, I think that’s one of the things that I love about his energy but just giving that inspiration to other people and being able to remind them that it’s doable. There are just things that you have to accomplish for yourself too. [00:16:10.8] JH: Right, I agree and did you read the latest Tony Robins, the money book and of course I mention it? [00:16:17.2] NT: I did read it, The Master of the Money Game? [00:16:20.8] NT: Yes, I did read it. I have some goods and the bad from it but I think the greatest thing about the book is I think over 50 people that he interviewed in different fields and the best in the world and they gave their advice, whether it’s a few pages on what they felt was the most crucial to have in order to be financially savvy as well as finically secure and what risk they took and I think that’s really helpful for people that are not really sure what steps to take. And being able to see mini-autobiographies of people who have really done well for themselves and for their communities as well. I think that’s one of the things that I really liked about his book. [00:16:57.8] JH: Right and it’s not a book that you, well yes you could read it on a weekend, but for me, I took my time. It took a month about I would say a month to read that because there’s just so much in there. He even talks about financial freedom and the different levels of financial freedom where some people when you think financial freedom is just getting out of debt. But he even takes it further in there where it’s more about not just that but the amount of money you have stashed for retirement. It’s about your lifestyle that you have currently. So it was different levels so I thought I took away a lot from that book but it’s definitely not a book that you just read over a weekend. [00:17:44.1] NT: No, not at all. [00:17:44.4] JH: For me in my opinion. [00:17:46.4] NT: And I am such a reader. I try to read as much as possible and so for me, I did read it quicker than I expected but yeah, it took me a couple of weeks because it was — but yeah, I had to set a time aside to do that and some of the chapters are not as easy as it might sound. So it’s like okay, read through but yeah, I really enjoyed it — oh yeah there is definitely so much to learn from it. [00:18:17.0] JH: …about how that came to be and a little bit about your book. [00:18:20.4] NT: Yes. So Financially Savvy in 20 Minutes, published a few years ago, it was actually written in a funny story the way it came about. Recent college graduates, more than anyone would want to say, years ago but I was sitting around I think it was during happy hour with some of my friends and living in Los Angeles we were talking about living with rent and our student loans and dealing with what felt like never ending expenses. It’s like, “No, we’re going to practice saying A and how does it look and what does it sound,” you know? And so I was like, “I need to start off with something that is going to be meaningful for them and helpful and really can help other people as well.” Because I’ve had so many people come up to me after like, “Oh this isn’t just for college grads.” These are people who are living on their own or have a family or have tons of debt and they are just trying to figure it out. So I just list five steps and this was after condensing a lot of my notes into a small read it in under 20 minutes because I thought people will say, “Oh sure I’m going to read the book,” and months or years have passed and they never read the book. So this is a quick get it out of the way and the five steps really helped them just tackle some of those fears and just know where to start and I think most people have that fear of, “Oh well I don’t know where to go,” or, “I’m not sure where,” or, “I don’t even want to know how much I owe,” and I give them some basic steps on how to do that. So I think when that came about my friends loved it and more and more people are like, “Oh I want that,” and so I got an editor and then a publisher. They’re like, “This is great” and it’s something that I started using in my financial literacy workshops at the colleges before they graduate from college and it was just such a helpful tool because a lot of those same questions that I would get from students and clients I put in the book because it was so easy. [00:20:57.9] JH: Well I love that concept of just reading it in under 20 minutes because you’re right. For a lot of people, we have the best intentions of reading whatever book, whether its personal finance or something else and apply it but we don’t finish it necessarily. So I love that and in the title, it’s under 20 minutes, read it. [00:21:16.8] NT: Yes, exactly. In one sitting. [00:21:19.5] JH: That is awesome. So I will be sure to include a link for that in the show notes. Now, I’m also really curious because one of your biggest passions is doing workshops and talking to first generation college students and the lack of financial literacy for them. So I want to hear about why and what brought you to do that. I have a feeling of what but I want to hear it from you, why is it your passion and tell me a little bit about those struggles that they face from the lack of resources and all that good stuff? And so first generation college students, that means a lot of different things. It doesn’t just necessarily mean you’re the first in your family to graduate from college, the chances are means you’re the first to have student debt, you’re the first to probably live on your own or having to move away for a new job. You’re the first to probably deal with a lot of money matters that most people haven’t. So with my non-profit when I saw that happening during these workshops and these questions that most girls were having, I wanted to be able to provide that. My passion has always rooted from, I think as a child as well, but to be able to empower people not just from education but giving them actual tools so they can take action because most people they say, “Oh knowledge is power. I’ll get it done”. Well if you’re not doing anything about it, how do you know where you’re going from there? And the steps that I said that are indicated in the book, the workshops were really helpful. How I came about even with the workshop was one of my old professors, she’s the dean at our school and they had a class for exits. So, students that are about to graduate who are seniors in college, they require you to take an online course, an actual workshop on how to deal with your student loans, how to deal with student debt overall and so I was lucky enough that they wanted me to come in. I did a few workshops and then other colleges nearby heard what I was doing and really love the mission because there weren’t many people doing that at the time. So that is just something that came about and as I started answering the same questions I would get all the time, I think this is one of the biggest things that I said, “Wow, this is a much bigger offset” and sometimes people think it’s just millennials or it’s just young people dealing with it. It’s not necessarily. You have a lot of people that are going back to school even after being in a career for 30 or 20 something years, finding themselves how to now handle student debt. [00:24:23.6] JH: And I love that you bring that up because it definitely made me think here. So second generation, my parents both were first generation college students in both of their families. But yeah, you definitely made me think here. You’re right, if they are going to college and they are taking student loans, they have to learn how to deal with that. So you definitely made me think on that and I have to do some thinking about my parents now and just do some reflection here because you don’t really think about that. You’re right, you don’t. So definitely what you’re doing is a wonderful thing. [00:24:59.2] NT: Thank you. It’s definitely rewarding and it’s definitely worth hearing it. One of my favorite stories I think I had mentioned the lady, she already had her two daughters one graduated from college and one was entering college and she had gone back herself and she told me all about the debt that she’d acquired with this and she also had a business of her own and really I wasn’t expecting it. I was excited when I got her response. But yeah, you come across, “Oh it’s uncharted territory,” especially if you’re in a different country or you’re just starting out on your own in a different industry that maybe your parents even if they did go to college whether you’re third or second generation learning to deal with credit cards that before they didn’t have credit cards back then. How to deal with that type of debt as well. So I think it’s really important to be able to acknowledge and make people aware that they can handle that too. [00:26:16.2] JH: Right, well I commend all your work because you’ve accomplished so much. You have mentioned a non-profit, of course, you’re doing the workshops, you have written a book, of course, property owner and different properties that you own. So I really commend you and congratulate you on all of those accomplishments, Natalie, because that is huge. [00:26:37.7] JH: So let’s wrap it up here because this has been fantastic and as you know, this podcast is all about making money simple and taking control of it because that’s what we do here. So how would you finish this sentence: Her money matters because of ____. [00:26:52.4] NT: Her money matters because it gives her a lot more choices and options than she could ever imagine. [00:27:00.3] JH: Love it that is very true, so thank you so much, Natalie, for being here. It’s been such a treat to speak to you, to speak with another Latina in the world of personal finance. Continue doing all the great things you’re doing because you are doing wonderfully. [00:27:16.0] NT: Thank you so much. It’s my pleasure being a part of it and at educatedlatina.com we are just so excited to be a part of this with you because you inspire us and you inspire so many women out there. Thank you for having us. [00:27:28.1] JH: Oh I appreciate you, thanks for those kind words. [00:27:36.8] JH: So what did you think? I hope that you enjoyed as much I enjoyed chatting with Natalie. It was really so insightful to really learn some things that you just take for granted or don’t even think about just to be aware of that gap that those first generation grads have that we don’t think about. As I mentioned during my chat with her, I never thought about this but it’s just so true because you achieve this great milestone and then potentially if you’re in that situation of having student loans, you have it and you don’t know much about it. Unless, maybe those parents who are really, truly on top of things but normally, you just don’t have their experience or knowledge to learn from because they didn’t go through that right? So you have these, not just the first to graduate college, but you have these other firsts that we don’t even think about. So I thought that was very, very cool and just be sure to check out her great work at educatedlatina.com. Well, Vetru I want to thank you, it means so much for you to write those kind words, give us a five-star review. I am glad that you are enjoying the podcast and if you are listening to this particular episode, if you haven’t already, join us on the community. I would love to connect with you in there. So again, thank you and I know that I don’t ask for reviews. That is something that I just haven’t — at the very beginning when I started this podcast I was definitely asking for those reviews because they do mean something. It really puts you in the world of iTunes, it’s the magic of how your podcast gets out there and in front of more people in iTunes. So if you love this podcast, if you haven’t given a review yet please, I would love it. It would mean the world to me just for you to take a few minutes out of your time. I show you how on the show notes. It shows you a little video exactly what you need to do. I know it’s a pain, they make it more difficult than it needs to be honestly but if you can, I would definitely, greatly appreciate it. So next week on episode 67, it is a special episode, I know all my episodes are special, right? I love each one of them though but in this particular episode, it involves you as a listener especially if you are in our Facebook community, I have asked for the best money advice that you wish you got as a kid. So definitely come back for that one in episode 67 and that is a wrap for today. I want to thank Natalie for joining us, for sharing all the goodness that she shared today and be sure to check out the show notes on where to find Natalie, about her book, how to get her book and more at jenhemphill.com/66. So thanks again and I will talk to you again on Thursday, the next Thursday that is.